Susan Areington of Lodge Brothers Woking has taken her dedication of care to her clients one stage further by volunteering for the Woking Street Angels. Street Angels are volunteers who believe that people deserve care and love in their time of need. Those needs could be as a result of homelessness, intoxication, drug abuse, assault or any other issue which has caused personal distress or the potential for physical harm. Street Angels help people whoever they are and whatever their situation, for example by listening, simple acts of generosity, caring, offering practical help or by referring people to other (specialist) agencies who can help them. 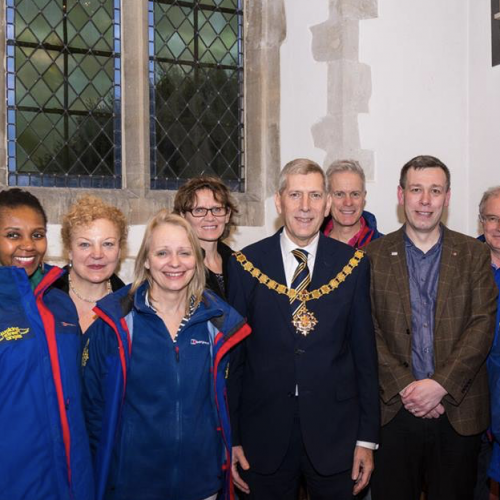 Susan was invited to an annual commissioning service held for new recruits at St Peter’s Church in Old Woking, Susan can be seen in the photograph alongside the Mayor of Woking and the founder of Street Angels Paul Blakey.